Is a maker of carefully assembled, hand-enlivened treats organized into an ornamental bundle for an assortment of events, occasions, and festivities. It began as a lady claimed business and was established in 1983 by Gwen Willhite. With the blend of two customary endowments of blooms and desserts, she made a flavorfully astute idea: The Cookie Bouquet. Her eatable bundles of exclusively formed and hand-embellished sugar and cinnamon chestnut sugar treats on sticks were cunningly masterminded in crate as heavenly presents for any occasion or event. These amazing endowments were moment hits among men and ladies alike, particularly on the grounds that the item "tasted in the same class as it looked" and was something for both sides to appreciate. Gwen's maturing venture soon exceeded her own home kitchen and her preparing use set foot onto a now 30+ year way of progress and constant development. After the Dallas business was set up, Gwen turned her consideration regarding the various solicitations from others wishing to begin their own Cookie Bouquet establishment. The initially diversified Cookie Bouquet area opened in 1987 and the force has been becoming from that point forward. 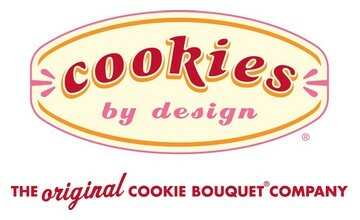 To better mirror the majority of the imaginative, novel and modified items sold, Cookie Bouquet areas changed their names to "Treats by Design" in 2004. Today Cookies by Design has around 80 stores across the nation with establishment domains still available to be purchased. They work in giving their clients the capacity to alter a treat present for their friends and family.